A few years ago, if you had asked me if I was ever interested in backpacking, I would’ve responded with an “oh Hell no.” Yet here I am, reminiscing about our first ever multi-day backpacking trip. Not just any backpacking trip, this one led me to the High Sierra, into the Golden Trout Wilderness with elevations reaching up to 11,160 feet. 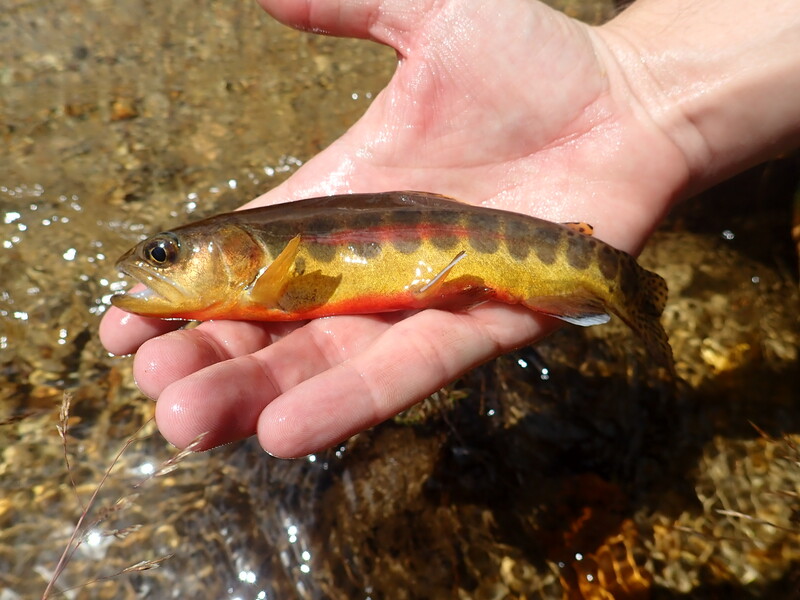 For over two years, my husband did countless research on native golden trout, and what it would take to set our eyes on them. Numerous hours of fly-fishing, fly-tying, and training consumed him and I both. We left our house at 5:11am and headed straight to Lone Pine to pick up our permits. From the 166 to the 395, we arrived and were greeted by the rigid mountains of the Eastern Sierra, Mt. Whitney in clear view. We headed to our destination. Alabama Hills, boulders, and windy roads calling out to us. We finally arrived at our campsite around noon, with plenty of time to mess around and adjust to the altitude. With camp set up, and lunch consumed, we decided to do a little exploring in the meadows. Low & behold, Matt finds the water and sets eyes on a golden trout for the first time. (Although just outside of their native range, golden trout have called this creek home for over 125 years.) Giddy and excited, we grabbed our Tenkara Rods to fish for them. Not long after setting up, and casting out an elk hair, Matt gets his first golden to hand. Mine came shortly after, and that evening we were rewarded with a handful more. After getting our share of goldens, we realized we should’ve been taking it easy since we had a long hike the following morning. So we packed up our gear, had some dinner, and to bed we went. Our group of three were the first ones to pack up camp and head to the trailhead. We started hiking at 7:25am. Destination: the top of Cottonwood Pass. Easy going from the start, until we hit the switchbacks, and my pace started to slow down. Matt and I successfully reached the top together. Grins and hugs were exchanged, and possibly a slight tear was shed. The view was absolutely gorgeous, it definitely took my breath away. After soaking in the view, and taking a small break, we headed downhill. Along the way, we were taking in as much scenery as we were able, and we happen to encounter a teenage black bear in a meadow. Curious and scared, he went on his way making sure we weren’t a threat by peeking through the bushes. A few more miles in, we stopped at a creek crossing where Matt immediately set up his fly-rod and casted out. Very quickly he had his first Volcano Creek golden trout to hand. While Matt’s dad, Steve, left to find us a campsite for the night, I had to get in on the action. Just like that, I landed my first native golden. With my tiredness wearing off, I managed to land a few more. We decided to take a break in between to have lunch, and set up camp. Refueled, we hung around and watched Steve try and catch a golden for himself, and that he did. Woke up to the sound of coyotes howling as the sun lit up the mountains. It was a slow morning for us, as we packed up camp and started hiking at 8:00am. The hike to our next stop had its own set of obstacles. First, we got off trail and missed the junction. It wasn’t hard for us to backtrack and start heading in the right direction. The hike mainly consisted of dense forest and kept us alongside Golden Trout Creek. With breaks in between we kept hiking on. Until we lost the trail again! Turns out, we needed to cross the creek and pick up the trail on the other side. We hiked for what seemed like forever. I was just about to drop, when we finally arrived at our next campsite along the South Fork of the Kern. Matt fished first, as usual, we couldn’t set up our tent until he landed a South Fork golden. Again, we had our share of fish to net. With fish, camp, and having got cleaned up, we were feeling tip-top and relaxed. Another early dinner was in order, luckily this time I was able to keep it down. Which also led to the best sleep I have ever had on trail. We left our campsite at 7:45am and headed out for the long hike ahead. It was a cold, crisp morning along the South Fork of the Kern. Before parting ways with the creek, we filled up our Sawyer filter bags to carry out extra water as we headed towards the next destination. Hiking, cows, and more hiking. Along the way, the trail took us through rancher territory where we had to cross through a gate and dodge cow pies, it wasn’t very pleasant. Plus the meadow was hot, open, and felt like we were walking through a desert. Luckily we packed the extra water because the water we came across was stagnant, and in a meadow full of cows. Yeah, no thank you. We took a good, long break at the bottom of trail pass. Contemplating if we should hike out a day early, which we did, but it wasn’t easy. Trail Pass almost had me dying, luckily Matt stuck by my side while Steve went ahead to meet us at the top. Along the way, the trail was hard to follow due to the recent rain that came a few days prior. We both made it to the top where Steve was patiently waiting. Switchbacks were the death of me. 2.3 miles left of hiking downhill to complete our backpacking trip. My adrenaline was pumping so I was able to keep up with the other two as we finally made it back to where we started. We happily took our packs off and settled into camp for one final time. Of course, Matt and I had to squeeze in one last hoorah and fish the meadows, because why not? Another morning awoken by the howling of coyotes. Packing up our gear, we were all tired and anxious to get home and take a hot shower. We said our goodbyes and headed down the mountain and into Lone Pine where we stopped to grab a bite to eat. You would think we starved ourselves the way we devoured our breakfast. Then we went to the ranger station again to pick up some souvenirs, and then it was homebound a day early. It was definitely some of the best days of my life, and I wouldn’t change a second of it.